"I FORGOT HOW GOOD THESE ARE!" Bacon makes everything tasty, but do you know what makes these even tastier? Farm stand tomatoes. Oh man! Where I live, the tomatoes are at their very best right now. They are ridiculously good! I'm buying them up, borrowing from neighbors' gardens and putting them in every dish I know how. And my husband is requesting BLTs. 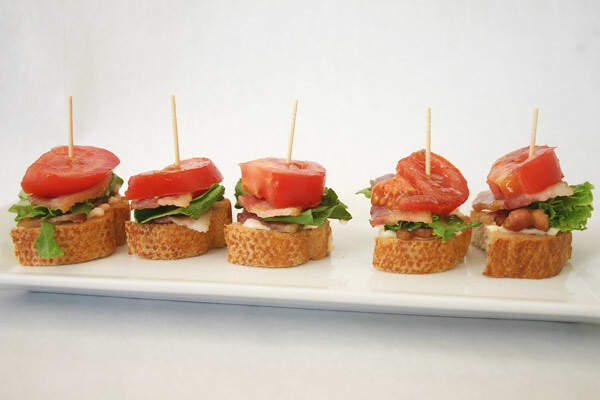 But if you have another dish to make and you just want a taste of BLT, just make these as a simple, yummy appetizer. You won't regret it. 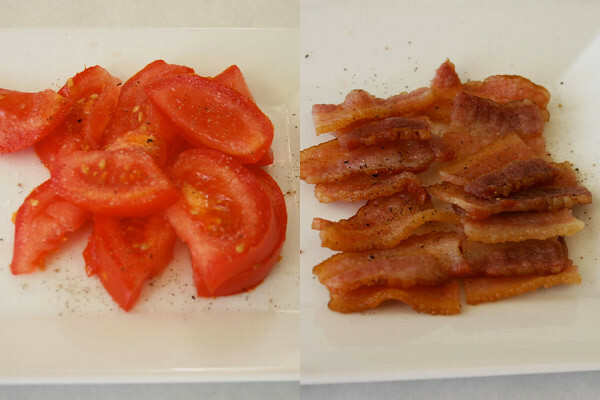 I sliced my tomatoes, cooked the bacon and cut it into 4 pieces per strip. Use thick bacon. Thin sliced bacon has a place and purpose in the world, but it has not business being on BLTs. Also, tear your lettuce. I love to use butter lettuce, but in these pictures, I was using green leaf lettuce. I also like to season the tomatoes with a little salt and pepper and give the bacon a little pepper too. I pick up a loaf of freshly baked french baguette from my grocery store. I slice it up, then cut each slice in half. 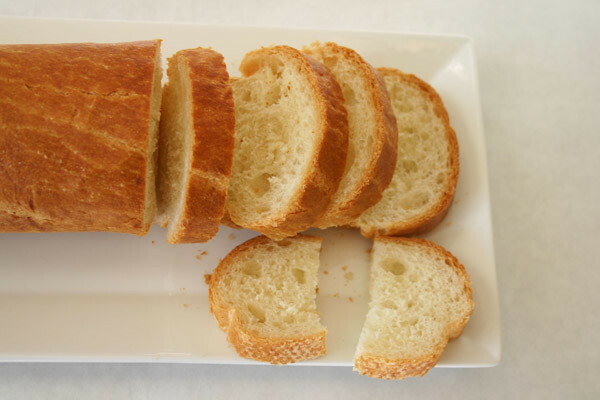 Next, I toasted the bread. I put it in the oven on 450 for just a couple of minutes. I watch it closely because the point of lightly brown to charcoal is a short time. Then I stack it in this order: bacon, lettuce, more bacon and tomato! Then put a toothpick in it. Now it is ready for guests to have two little bites of heaven. And you have to admit the presentation is pretty darling. 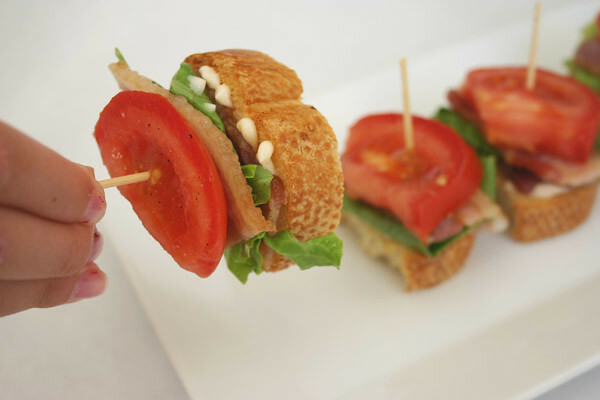 Who doesn't love a baby BLT? 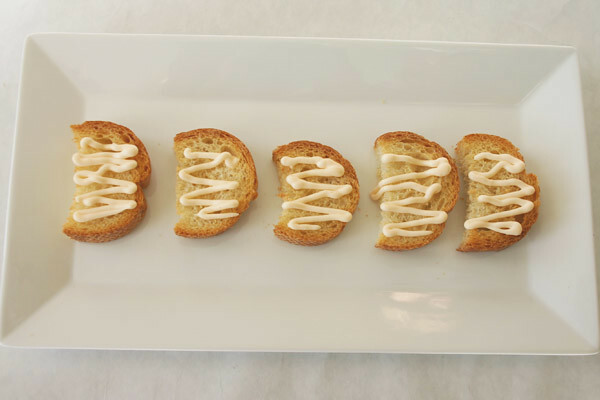 I ran a little taste panel on these appetizers, with subtle variations to see what people preferred. I thought I'd tell you the results of my small group's opinions. Bread: I served them with a slice on top and bottom vs. an open face BLT. 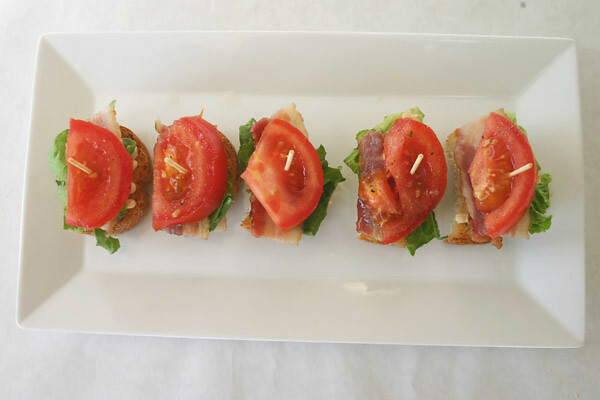 Open face BLT won! 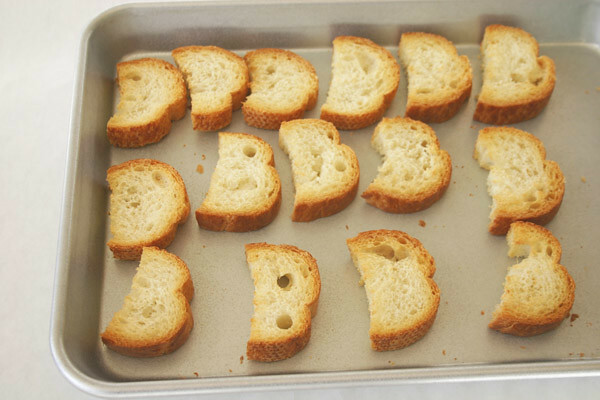 I also tried it with toasted vs. soft bread. Toasted won! I tried buttering the bread before it went in the oven vs. leaving it dry. There was no preference. (Once the mayo was on, it added some moisture and they couldn't which bread had been buttered). Bacon: I served some with different amounts. One left them wanting more bacon ratio and three was too much. My taste testers preferred two slices. Tomato: I made some with a cherry tomato and some with sliced. Sliced was preferred. Lettuce: Most people didn't like too much lettuce. Just a little for the crunch factor. Mayo: Spicy mayo was for sure preferred over regular mayo. Don't laugh, I take crowd pleasing appetizers very seriously. I can't go on my opinion alone. I prefer these with a little slice of avocado on top too, but they brown pretty fast and if you're making a lot, they can't sit and wait. "I forgot how much I love BLTs!"